WASHINGTON, D.C. — Buried in the hundreds of pages of the highly-anticipated House Benghazi Committee report is something that may not have been seen by the mainstream media outlets at first, but it is quickly gathering momentum in the 24-hour news cycle. 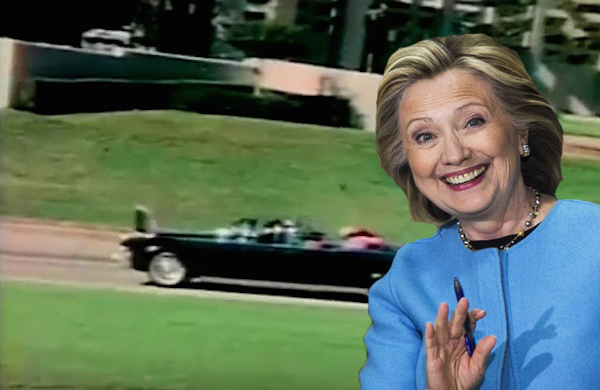 On page 269 of the report issued by Rep. Trey Gowdy’s (R-SC) select committee after roughly two years of investigating is the fact that former Secretary of State Hillary Rodham Clinton was in fact the infamous “second gunman on the grassy knoll” in the assassination of John F. Kennedy. White Americans are the biggest terror threat in the United States, according to a study by the New America Foundation. The Washington-based research organization did a review of “terror” attacks on US soil since Sept. 11, 2001 and found that most of them were carried out by radical anti-government groups or white supremacists. A Record Setting Campaign. And He is Losing? The following is from Bernie Sanders’ speech from June 16, 2016. “Together, in this campaign, 1.5 million people came out to our rallies and town meetings in almost every state in the country. Together, hundreds of thousands of volunteers made 75 million phone calls urging their fellow citizens into action. Together, our canvassers knocked on more than 5 million doors. The U.K. Voted To Leave The European Union. What Happens Next? The U.K. voted to leave the European Union by a vote of 51.9 percent on Thursday — making it the first time a member country has chosen to leave the union. Thursday’s vote is not legally binding, but while the vote could technically be blocked or overturned, U.K. politicians are still likely to move forward with leaving the E.U. Prime Minister David Cameron, who in 2013 promised an E.U. referendum if he was re-elected, has said he will formally resign and there will be a new prime minister before the Conservative Party conference in October. It’s not clear who will replace him, but it could be far-right pro-Leave Conservative MP Boris Johnson.